We offer you unbiased ®SMART( Strategic Movement Around Retirement Taxation) advice to help you select the right path that fits your future financial goals. How to reduce the amount of money you give to the IRS in retirement? How tax diversification can save you money on your future retirement income taxes and increase your income? Learn the 3 dates that changed the face and future of the American retirement system and what to do once you understand these hidden risks? Learn what Warren Buffett is doing now to make profits and how everyday investors, like us, can benefit from a similar, little-known strategy? 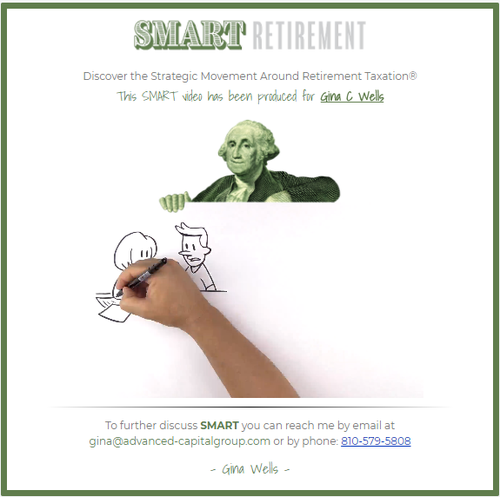 Enter your contact information below for a link to the full SMART Retirement Video! For more information about our firm and the services we offer, send us a quick email or call the office.